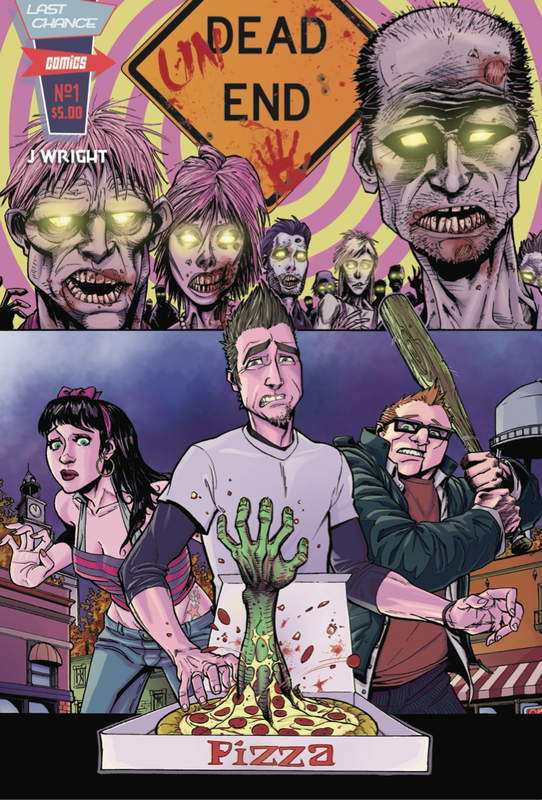 When I was asked to review UnDead End, my initial reaction was to scoff and think, “Another zombie book?” Then I read the information that creator J Wright included with the first issue and realized that he was involved with all aspects of the production, including writing, pencils, coloring, and lettering. I wondered if the book would suffer because he had stretched himself too thin, but apprehension quickly turned to excitement as I delved into the comic. Wright is a graduate of the Joe Kubert School of Cartoon and Graphic Art and has worked behind the scenes in comics since graduating in 2009. Considering that Wright was involved with all aspects of the book, this isn’t one of those instances where you get sucked in by the cover art only to find out that the art inside is nothing like what initially hooked you. In fact, Wright’s art is probably the most captivating part of this book. There’s something about it that keeps you going back for more. He does a great job of establishing that he can carry a book by himself with his work on this issue. The story itself is not something new, but it has a fresh enough voice to keep the reader’s interest piqued. It begins with an introduction to the main character, Dean Bekker, who is a 20-something hypochondriac on his way to work at a local pizza joint. It’s established pretty quickly that he’s not very motivated, he got picked on in high school, and he just doesn’t really seem to want much more out of life. All of this changes when he reconnects with Molly, who attended the same high school as Dean . They make plans to watch a movie when he gets off work, and things take a turn for the worse in the city shortly thereafter. 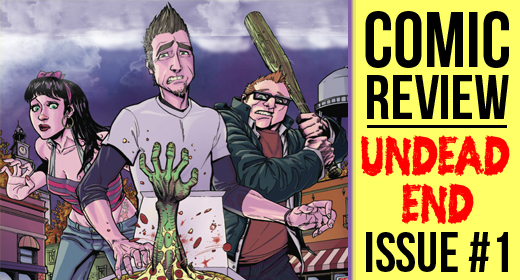 Issue 1 (the first in a three issue mini-series) ends just after Dean realizes that undead creatures are slowly taking over the city. There are hints that the military is trying to cover something up and keep the city safe, but we don’t get a real explanation about what is happening to the city’s inhabitants. The only real problem that I had with the book is a bit of dialog between Dean and his buddy Nolan. It feels a bit forced, and it seems out of place and maybe a bit cheesy. But I reminded myself that it’s a comic book, and maybe it would come across differently in a moving medium like TV or film. Have you heard the latest episode of the JustUs Geeks Podcast yet? CLICK HERE NOW! Overall, I certainly enjoyed it and I definitely look forward to reading the next two issues and finding out what is afoot. Scotty Meier liked this on Facebook. Eclipse – The Comic liked this on Facebook. Trevor N Talbott liked this on Facebook. Jason Wright liked this on Facebook. UnDead End liked this on Facebook.